DentalPlans.com Review: Can It Really Save You Money at the Dentist?. Does DentalPlans.com Really Save You Money? DentalPlans.com is an online listing of all of the dental plans offered in your area. The premise is that you can use their service to quickly scan, analyze, and review the different plans, and pick the one that is right for you quickly and easily. But do they really have the best plans available, or are they just showing you the plans that make them the most money? Few people like going to the dentist, and getting the bill can be the icing on the bad-tasting cake. There are plenty of dental plans out there to help defray these costs and make it somewhat more enjoyable, as getting preventive work done is often a much better idea than letting things get worse and worse. Some plans are notorious at denying claims, while other plans only cover certain procedures and family members. It can be hard to sort through them all and pick a winner, and that’s what DentalPlans.com says it can help with. They say that you’ll be able to save money when you get your teeth cleaned, when you go in for regular check-ups, when you get work done like fillings, braces, and other procedures. They also say that your plan will be activated quickly, and you don’t have to mess around with a bunch of paperwork. They claim to have a lot of variety when it comes to choosing a plan that’s right for you and your family, and they have plans available in each state. It’s free to browse the plans on DentalPlans.com but if you go with one they’ll charge a $15 set-up fee. This cost is offset or taken care of by them giving you 3 free extra months on most plans. The cost of the dental plan you choose will vary, and is not hidden from you. You’ll be able to use price as a factor when comparing the different plans, and be able to choose a plan that has the features you want at a price you can live with. There isn’t any commitment to using DentalPlans.com, they don’t even make you sign up in order to get most of the information you need to make a decision. When you find something you like and want to sign up for, of course you’ll have to give them additional information so that you can get registered for your chosen plan. Once everything is set up, your commitment level is pretty low. You will have to take the necessary steps to make sure that any dental work gets paid for by the plan, when applicable. DentalPlans.com offers a lot of information in one place, which saves you from having to sift through dozens and dozens of different plans out there. They’ve made it relatively easy to see all of the plans available to you, all laid out with their features listed, and what they cover and don’t cover, as well as an estimation of how much you might be able to save for different procedures. You can go from knowing nothing about the plans in your area to having a good idea of what they offer in about 3 minutes. We looked for a weak spot with DentalPlans.com but couldn’t really find one. They seem to earnestly try to make the process as easy and information-packed as possible, leaving the final decision in your hands as to which one you want to go with. They offer highly-rated and quality plans, as well as ones that would be affordable to most people. As an aggregator of dental plans, DentalPlans.com flat out works. In just a few seconds you’re presented with dozens of different plans that cover dentists in your neck of the woods. Since they’re collecting a processing fee, it removes the conflict of interest of promoting plans that will pay them the highest referral bonus. This allows them to list all of the plans, and treat them objectively, seeing how they make the same amount no matter which one you go with. It is possible that they still do collect a referral fee in addition to the processing fee, but we were unable to determine this during our review. It can’t hurt to see what sort of plans they offer, since you’re not under any obligation to agree to one. Knowing what your different options are is always a good idea, and if they really can save you money it makes sense to go with it. The alternative is doing it all on your own and reading through all of the different pitch pages for each individual plan, and trying to sort out which ones are better than others. When they’re all so similar it’s nice to have it all laid out for a quick comparison. What do you think? Does DentalPlans.com work or not? 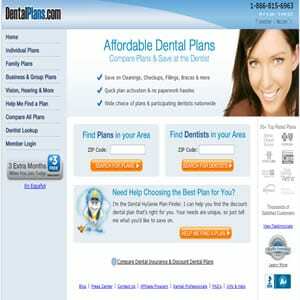 DentalPlans.com is an awesome way to compare plans and find the right one for you. It really helped me find an affordable plan, which was really needed. Dental work is so EXPENSIVE! This company won’t work for you Sohpie777, US only. I’m sure though there are suitable alternatives in Canada.